Hennessy Declassified 2018, a one of its kind affair which happened last week was yet another spectacle occasion to behold. To celebrate the arrival of its vineyard and cellar from Cognac, France to Kuala Lumpur, Hennessy brings the team from Sevenpie on its debut night through a course that unraveled Hennessy’s myths and modern lifestyles which allows us and their esteemed guests to walk through the elaborate areas explaining the wonders of Hennessy. This time around, Hennessy Declassified 2018 creates interaction with their crowd in a whole new ballgame by encouraging their guests to rely fully on their senses through various zones made available within the vicinity itself. The team from Sevenpie spruced up for this very event and upon our arrival at the penthouse of Menara KEN, we were instantly whisked into the venue and there’s where we started our journey in the ‘Walk in Cognac’ zone. This is where visitors were provided with the view of the changing of seasons in the Cognac region, and an illustration of the distillation process of the eaux-de-vie through an interactive display. Shown in picture: The original oak barrel from Hennessy, you can take a whiff of alcohol close up! 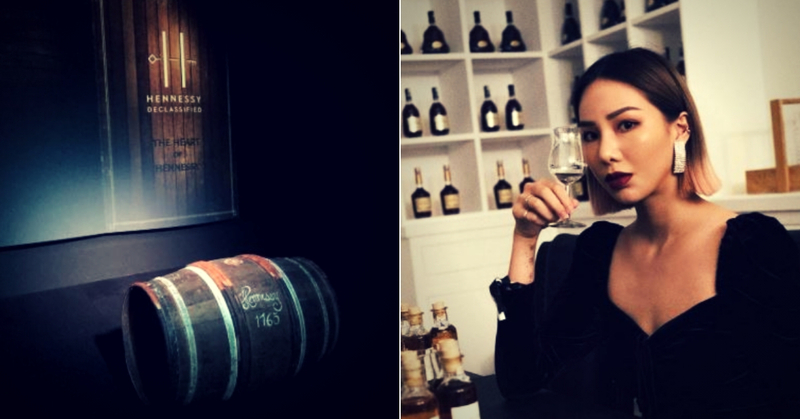 At the ‘Heart of Hennessy’ area, the brand’s famed craftsmanship and skills that have been passed down from one generation to the next were explored through a comprehensive showcase of the entire cognac-making process. The Heart of Hennessy gave us a better understanding on how eaux-de-vie ages in French oak barrels until it is transformed into Hennessy cognac. Visitors also got a full experience of Hennessy’s grand tasting room as they re-created a replica of it. From what we’ve gathered, back in the room back in France, Hennessy’s hereditary tasting committee which includes the Master Blender, who are in charge of tasting, choosing and making decision for an exceptional blend of Hennessy cognac, gather to taste and select the eaux-de-vie at 11am every morning. In short, the taste and sensory experience of Hennessy were intricately put together by the pundits of Hennessy world. I mean, when the master of its craft takes their business seriously, you can expect nothing but sublime from them! Visitors were then ushered to next destination of the journey, which was a room completed with the full range of Hennessy’s iconic collection. Hennessy Paradise Imperial is the result of precise selection, where on average of only 10 out of 10,000 eaux de vie are carefully selected to be blended to become one of Hennessy’s rarest and most celebrated variants! Talking about rare gem! What would be Hennessy Declassified 2018 without its free flow speakeasy bar? Hennessy’s trademark drinks such as Hennessy XO, Hennessy VSOP as well as Hyde 53’s signature cocktails like Frenchie Tea, Hyde craft bottling and Popping Grenade were served to their guests. We also got the opportunity to linger around with the likes of Jane Chuck and Brian See! ‘Twas a splendid night to remember and we couldn’t thank the team from Hennessy for having us over!